Camping and touring sites next to the beach get a big tick from us. Imagine, the joy of not having to load up the car with mountains of beach paraphernalia and over-excited kids. Instead, you leave your pitch and head straight to the sand from your campsite. Later, you scramble up the beach path and arrive back at the site in time for tea, perfect. Here’s a selection of our favourite coastal campsites from around the UK. A stone’s throw from beautiful Mevagissey Bay, Pentewan Sands Holiday Park in Cornwall is a privately owned 5-star park, with a private beach and two indoor swimming pools. The site boasts excellent family facilities and offers electric and non-electric pitches for motorhomes, touring caravans and tents. All of the pitches are no more than 3 minutes walk from the beach with a few beachfront pitches literally meters from the sea. Enjoy! You’ll never be more than a few minutes from the beach. Cornwall is a mecca for spectacular beaches, but Perranporth beach is one of our favourites. The relaxed vibe and massive beach draw us back year after year. 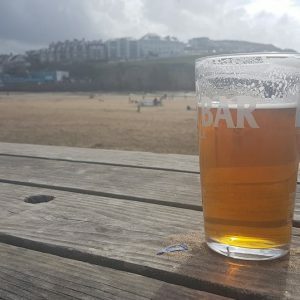 We checked out Perranporth Camping & Touring Park earlier this year and it’s lovely. Grassy pitches for tents and tourers, electric and nonelectric hookups. It has an onsite shop, bar and a 17m outdoor swimming pool and terrace. The site is located perfectly for Perranporth village and the beach, where dogs are allowed all year round. It’s also a short stroll home from The Watering Hole, the UK’s only bar on a beach. On-site swimming pool and bar. Vast dog-friendly beach. Cornish coastal views and surf. Golden sands, breath-taking views, and lulled to sleep at night by the sound of the Atlantic waves breaking on the beach, welcome to Mother Ivey’s Bay. Calm, quiet and award-winning, Mother Iveys is a beautiful spot for families on the North Cornwall Coastline. A wide range of touring and camping pitches are available, and dogs are welcome on the site and on the beach. Calm, quiet and family friendly. Whitecliffe Bay is a hidden gem near Bembridge on the Isle of White. The campsite overlooks the stunning private cove with calm waters. Parts of the site are newly refurbished, including an indoor and outdoor swimming pool that our kids loved. The impressive Nab Bar overlooks the outdoor pool and has views out to sea, and beachside cafe is great for grabbing a bite to eat. There’s a daily programme of activities and entertainment for the kids and in the summer an outdoor cinema. Worth noting; the touring and camping facilities are set further away from the main facilities and beach than the other accommodation, and the park is split into two by a public road, definitely a consideration for families. Great on-site facilities. A safe (and quiet) private beach. 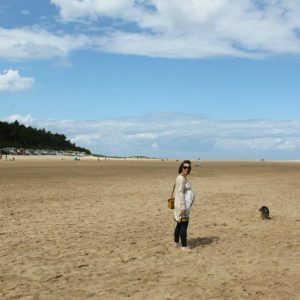 Wells-next-the-sea has a vast and beautiful beach, lined with pretty painted beach huts. It’s an idyllic spot. Pinewoods Holiday Park is a picturesque site, set back from the beach behind pine-topped sand-dunes. Pitches are available for touring caravans, motorhomes and tents and the facilities are to a very high standard, as is the site. We loved hopping on the miniature train into Wells-next-the-sea. Board next to the site entrance and alight in the bustling and historic port. Perfect! Picture perfect beach. A train ride to the town. A couple of miles east of the eclectic and lively beachside town of Brighton, you will find Brighton Caravan Club site. It’s nestled behind the busy marina and is a short stroll to the beach. The site offer pitches for touring caravans and tents and is an awesome location to explore all that Brighton has to offer. We visited Brighton not long ago and checked it out, it’s a lovely site and a great spot to visit the beach. An eclectic mix of seaside and city life. Min Y Don campsite is found on the coast road that heads to Harlech beach, and you can’t really get a more stunning location. 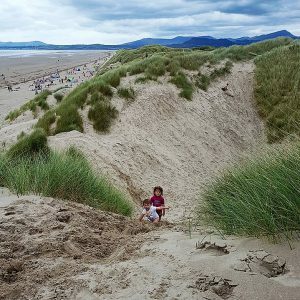 A 13th century World Heritage Castle, miles of beach with incredible sand dunes, and spectacular mountainous views of Snowdonia National Park. We loved our stay at Min Y Don campsite and wrote a review about our week in Wales. If you’re looking for a campsite with stunning sea views and magnificent sunsets, Pencarnan Farm could be the one for you. Pencarnan is 96-acre working farm that stretches right to the high water mark onÂ Porthsele beach. Situated on the most westerly point of Pembrokeshire looking out toward St Georges Channel, you can see where the Irish sea to the north meets the Celtic Sea to the south. The site is directly above Porthsele beach, a sandy beach with plenty of rock pools at low tide. It is safe to swim in the sea and you’ll often spot people kayaking in the bay. Stunning sea views. Safe family beach. Award-winning Ladram Bay Holiday Park has its very own beautiful and secluded beach, and it’s only a hop, skip and a jump from the campsite to the sand. Found on the Devon coast between Sidmouth and Exmouth, Ladram Bay is a great spot for watersports, with a sheltered beach that’s safe for families. The privately owned park also has a heated indoor pool. On-site facilities including a pool. Watersports. The magnificent dunes and golden sands of Beadnell Bay are just minutes from the campsite. Here you can stroll along the stunning beach to Beadnell or Seahouses, or catch a boat to the nearby Farne Islands to see more of the beautiful wildlife found in the area.